How can we meet the call for more appropriate and robust evaluation? How do we generate more rigorous and relevant evidence? These were some of the questions explored by more than 30 people with an interest in evaluation, including commissioners, researchers and the public, at a workshop in December organised by the West of England Evaluation Strategy Group. 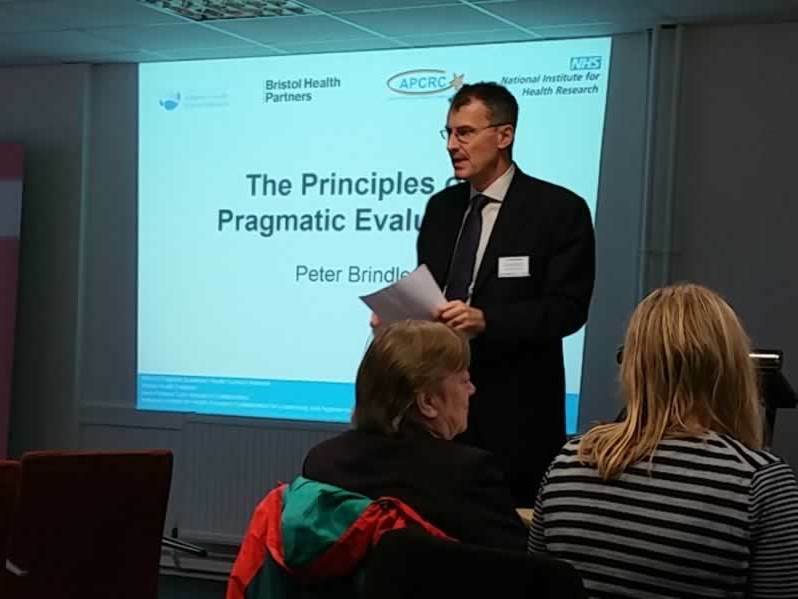 The interactive workshop explored the principles of pragmatic evaluation, and was led by Dr Peter Brindle, Leader for Commissioning Evidence Informed Care at the West of England AHSN and Evaluation Lead at the National Institute for Health Research Collaboration for Leadership in Applied Health Research and Care West (NIHR CLAHRC West). It was jointly organised by CLAHRC West, West of England AHSN, Avon Primary Care Research Collaborative (APCRC) and Bristol Health Partners. The key note speaker for the day was Professor Jo Rycroft-Malone, Director of the National Institute for Health Research (NIHR) Health Services and Delivery Research (HS&DR) Programme. Jo described some of the challenges, opportunities and implications of pragmatic evaluation for the Programme. These included the implication for research methods, the need to agree what is ‘good enough’ evaluation, how to bridge the gap between those knowing and those doing, and what the rules of engagement are. How do we best involve patients, carers and the public in evaluation? How do we ensure that evaluation is of value to health and social care? How do we build a culture of evaluation? How do we create an ethical approach to evaluation? How do we make the trade-off between rigour and relevance? both rigorous and relevant evaluations. There was also interest in the Researcher-in-Residence model being driven by Martin Marshall at University College London, Peter Brindle through his work at the Avon Primary Care Research Collaborative and Lesley Wye at the University of Bristol. This was acknowledged as an excellent way of bridging the ‘know-do’ gap and supporting putting evidence into practice. The organisers would like to say a big thank you to all those who participated for their excellent contributions and commitment to actions to help drive this agenda forward. The full workshop and evaluation report is being pulled together and will be available in the coming weeks. This report will be used to inform the future vision, strategy and action plan for evaluation across the West of England. For more information or to get involved contact Jo Bangoura, Evaluation and Commissioning Lead on j.bangoura@nhs.net.